Who was Kath Peters, really? 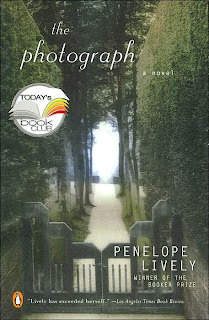 That's the question everyone is asking in Penelope Lively's The Photograph. Answers will vary, based on who's asking, but one fact will emerge - Kath hid plenty behind her pretty face. Soon after her death, Kath's husband Glyn finds an envelope marked, "Don't Open. Destroy." Inside lies a snapshot. Glyn doesn't recognize the setting, but he spies his wife holding hands with another man, a man who is, in fact, her brother-in-law. The image "smolders in its envelope, and in his head" (16), forcing him to face the fact that he didn't know his own wife. This "unreliability about my own past" (98) shakes him to his core. He deals with the problem in the way he knows best. As a historian, Glyn has done plenty of research, so he turns his investigative skills to the subject of his marriage. His search consumes him, but this is "par for the course; Glyn does obsession, always has, a five-star capacity for obsession is what makes him a painstaking researcher" (115). As part of his quest, Glyn confronts those who knew Kath best - her sister, Elaine; Elaine's husband, Nick; Nick's business partner, Oliver; and Kath's closest friend, Mary Packard. Each of their voices, as well as that of Polly, Nick and Elaine's daughter, offer one piece of the puzzle that was Kath. Ultra-responsible Elaine remembers only her frustration with her irresponsible younger sister. Nick, who has "remained in a time warp of feckless adolescence" (182) can't understand why Elaine cares about his long-ago fling with her sister. Oliver wants only to put the past behind him. He regrets both taking and saving the damning photo. Ironically, Mary Packard, the one who spent the least time with Kath, is the only one with any real answers. While the others saw only Kath's pretty face, the fine features which allowed her to float through life shunning all responsibility, Mary heard the woman's secrets and desires. Mary's morale is a familiar one: Things are not always what they seem. This novel is so difficult to describe because it isn't a story as much as it is a series of character studies. Basically, Lively takes a situation - Kath's infidelity - and examines how each person reacts to it. She mines their psyches to make statements about grief, identity, marriage and love. The result is a melancholy novel populated with sad, bitter people who can't get over the death of the only person (apparently) who brought any light to their lives. The story is depressing, really, although I also found it surprisingly compelling. Although The Photograph feels dark and brooding, I found the writing quite beautiful. It's haunting, to be sure, but also rich and evocative. While scrutinizing his marriage, Glyn observes that "It is the subtexts that signify, the alternative stories that lurk beyond the narrative" (22). The same could be said of this novel - its truths are in the details. I thought a lot about this book, but I can't say I really enjoyed it. This sounds like something I would really like. I tend to like dark, brooding works, which is funny because I'm really a very upbeat person.